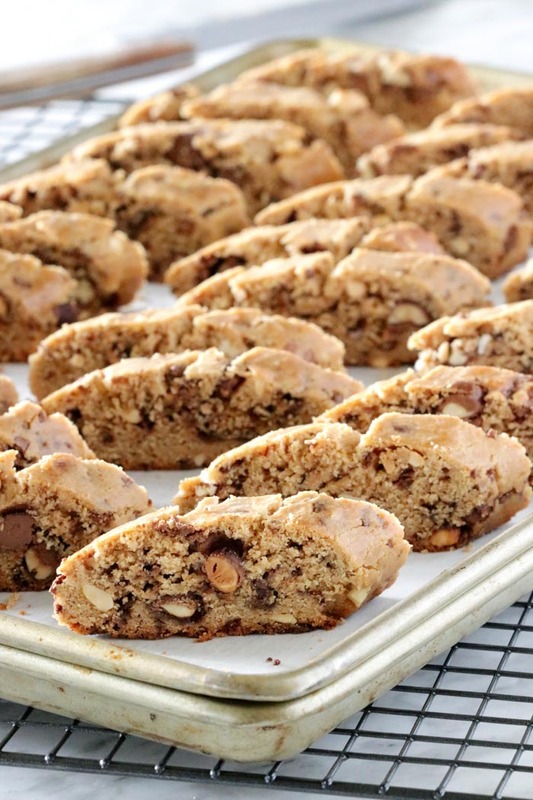 These Chocolate Peanut Butter Biscotti are reminiscent in taste of the much beloved peanut butter cookie! They are over the top delicious with a combo of a melted chocolate and peanut butter drizzle which are then topped with more crushed peanuts…just because! 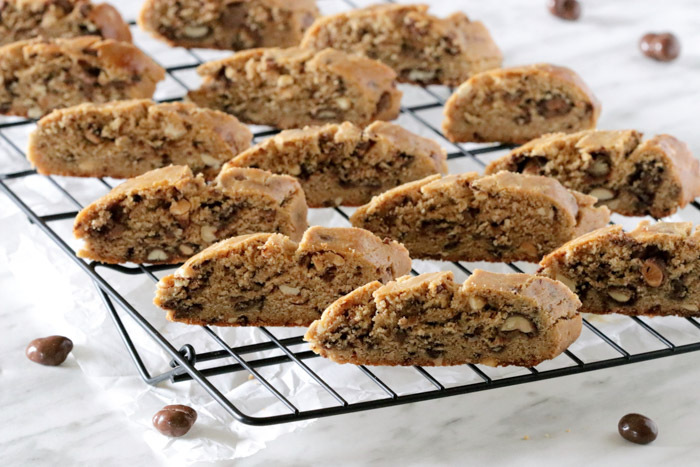 Lately my daughter has been craving peanut butter cookies and being Italian of course and also loving biscotti so much…well… I had this irresistible urge to come up with a peanut butter biscotti. These morsels are chock full of chocolate covered peanuts that is mixed into the dough alongside some all natural peanut butter for that special flavor we all love so much. Simply for extra indulgence and also because one can never have too much chocolate in one’s life, I melted some semi sweet chocolate, stirred in some peanut butter then drizzled this yummy mix over the biscotti. Are you swooning yet? They were then topped with crushed chocolate covered peanuts for more delicious goodness! And so after some love and labor the Chocolate Peanut Butter Biscotti is born. Surely you must be swooning now! 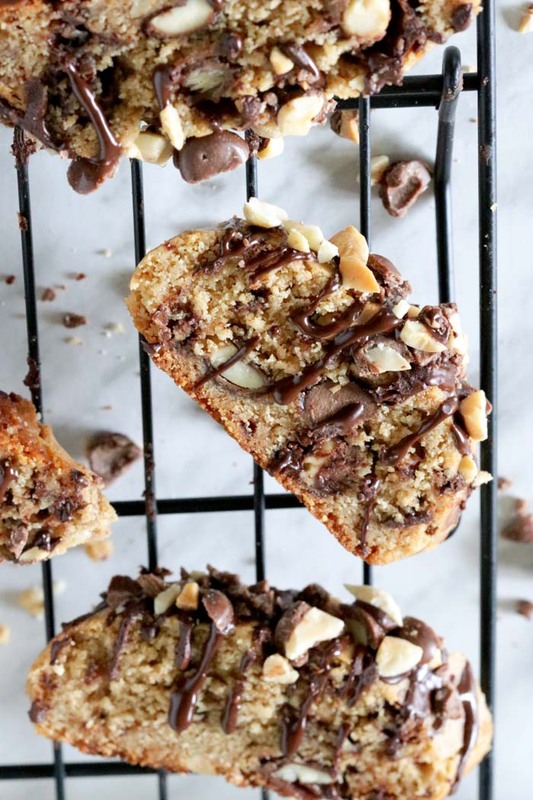 I love to brush my biscotti with some beaten egg whites before the first bake for a slight sheen, however its totally optional in this recipe since the tops are drizzled with chocolate and sprinkled with peanuts. Here’s a handy kitchen tip: If your oven tends to brown the bottoms of baked goods over much, double up on the cookie sheets as this creates some insulation between the baking sheets and disperses the heat much more evenly. This has always worked for me! As in most biscotti recipes they’re really quite simple to make and don’t require a lot of work. And as an added bonus they keep extremely well in an airtight cookie jar for a week, however at my house they disappear so quickly! Even when hidden from sight, someone always sniffs them out! Also if I might add, they are extremely tooth friendly! 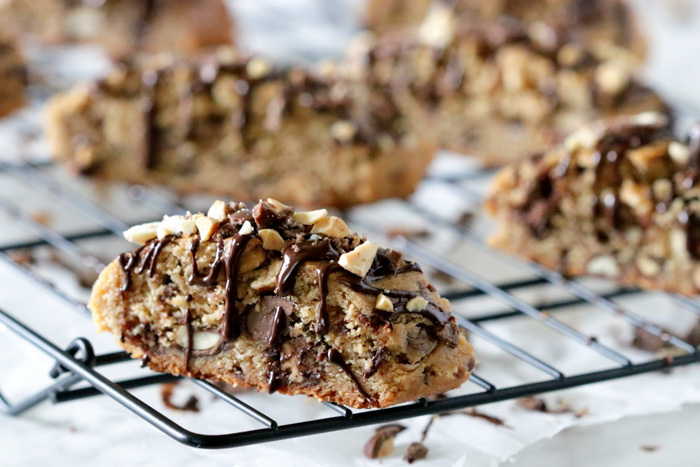 These Chocolate Peanut Butter Biscotti are reminiscent in taste of the much beloved peanut butter cookie! In a large bowl beat the butter, sugar and peanut butter on medium high speed just until fluffy for a minute or two. Next, beat in the eggs and vanilla extract until combined. With the mixer on low speed, beat in the flour mixture just until combined. Stir in the coarsely chopped peanuts. 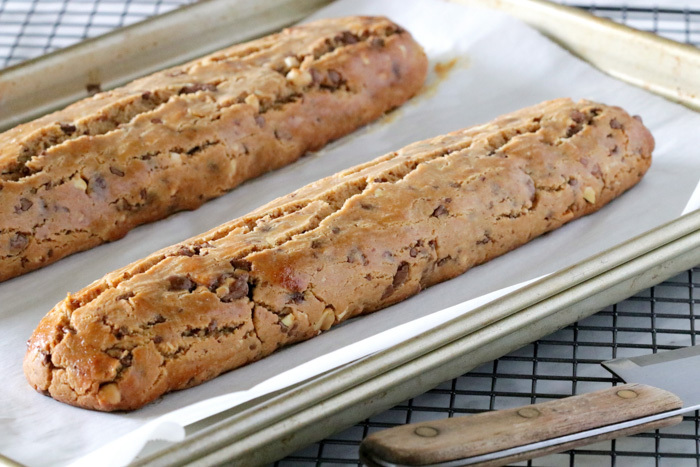 Divide the dough in half and roll each portion on a lightly floured work surface into a 12 inch log and transfer each log to the prepared baking sheet. Brush the biscotti with the beaten egg white. Bake in preheated oven until golden brown for about 25 minutes. Once cooled, slice the biscotti crosswise into 3/4 inch pieces and place upright back on the baking sheet. Return to the oven and bake an additional 15 minutes. Let cool then drizzle with chocolate peanut butter and sprinkle some chopped chocolate covered peanuts. Place the 2 ounces of chocolate in a microwave safe bowl and melt in the microwave for about 60 seconds while stirring every 15 seconds till melted. Drizzle the chocolate peanut butter over the biscotti and sprinkle with the remaining chopped chocolate covered peanuts.